Gethin Jones is a popular TV and Radio presenter. Born in Cardiff, Gethin was educated in the Welsh language and went on to obtain a degree in Economics and Geography. Gethin’s presenting career began on the Welsh version of ‘Top of the Pops’, ‘Popty’ on S4C. However, it was ‘Blue Peter’ that cemented Gethin’s reputation as a talented presenter and household name in 2005. Whilst a member of the ‘Blue Peter’ team, Gethin visited 31 countries, taking on extreme and obscure challenges from flying with the Red Arrows in a WW2 Spitfire to being attacked by an alligator in a Louisiana swamp! He also raced a horse at 40mph, skated the infamous Cresta Run in St Moritz, fought as a Samurai Warrior in Japan, and survived a life threatening submarine escape training exercise. All of these achievements aside, Gethin’s biggest moment was when he became the first ever civilian to finish the UK Royal Marine Commando 30 mile Yomp – finishing in a time of 8hrs 20mins. In 2007, Gethin made it to the semi-final of BBC1’s ‘Strictly Come Dancing’. In the USA, Gethin has hosted ‘Dancing with the Stars: All Access’ and ‘Fear: Buried Alive’ for the US network channel A&E. 2016 saw Gethin secure the role as a Heart FM presenter alongside Caroline Flack on the Sunday breakfast show. In addition, Gethin joined Zoe Ball as a presenter on ‘Strictly Come Dancing’s’ spin off show, ‘It Takes Two’. 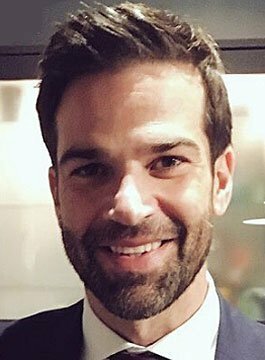 With a wealth of broadcast and presenting experience, Gethin Jones is recognised as a ‘safe-pair of hands’ as a corporate event presenter and awards host.